This article is about the available 2015 Chevy Colorado GearOn System including what it is and how to get it. Click here if you're looking to browse our selection of Colorados or call our World Class Internet Department at (800) 680-0835 to schedule a test drive or if you have additional questions. 2015 Chevy Colorado available GearOn system Cargo Divider in action. 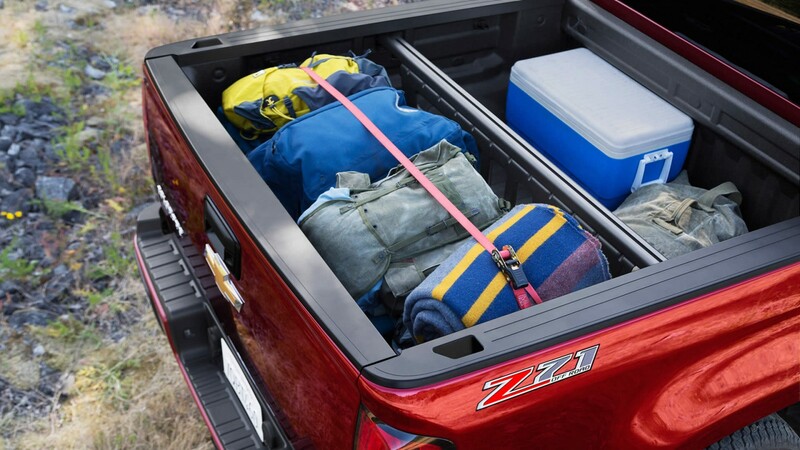 The GearOn System is an available accessory and cargo management system for the all new 2015 Chevy Colorado. It is not a standard piece of equipment. It can be purchased through your local General Motors dealership’s Parts department. Ours is available at (800) 724-2614. What does it do? Great question! Lucky for you, though we haven’t been able to get our hands on it yet, we do have the information straight from Chevy. It’s still really hard to find any actual information on it other than a brief “it exists” anywhere. So here’s what you needed to know about the 2015 Chevy Colorado GearOn System. 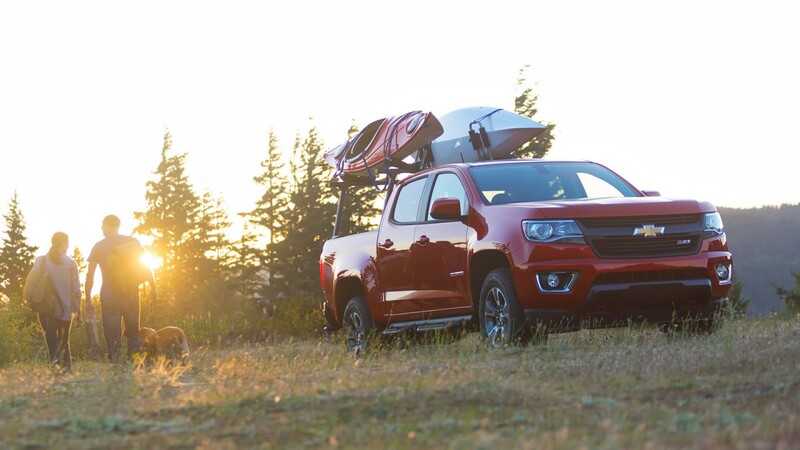 The 2015 Chevy Colorado GeaOn System has several applications including easily storing and hauling kayaks and canoes. There are a few things about the brand new 2015 Chevy Colorado’s available GearOn system that really make it shine. Let me share with you the three best things about it that I’ve found. It’s engineered to be very versatile, hassle-free and not negatively impact your fuel economy so it doesn’t stop you from using it. The GearOn system is designed with a various amount of lifestyle applications in mind. It creates flexibility by reusing GearOn crossrails. You don’t have to have the highest trim level for Chevy to have you covered either. Chevy has made the GearOn system available on all trim levels of the 2015 Chevy Colorado. It’s designed to have practical utility for both business and pleasure. There are several configurations to help both the commercial user and those with an active lifestyle. It’s capable of attaching to multiple locations on the truck bed side for loading various lifestyle products (canoes, kayaks, mountain bikes, etc.) on to the vehicle. It still maintains a cargo area underneath for accessories, gear, equipment and tools. A cargo bed divider (pictured above) can be interfaced with the GearOn system to allow related gear to keep from moving around during travel. There are several available stanchions for kayaks, canoes, ladders, lumber, etc. The available GearOn system is designed to help you do the things you love to do. It’s easy to install without any drilling or damaging the box of the Colorado. It’s supposed to be very simple to accommodate whatever use you have for it from Kayaking, Canoeing, Mountain Bikes, and carry and store ladders, lumber and more. It’s also built with a load capacity maximum of 500lbs. The GearOn system is designed to be used frequently. With this in mind, the engineers did everything they could think of to keep it from weighing you down. It’s designed to be very lightweight without being fragile. It’s also shaped to be as aerodynamic as possible. So there you have it. We’re very much looking forward to getting our hands on the GearOn system as soon as we can get it in our stores and might do a short video to demonstrate. Just keep an eye on our YouTube channel where you can get information on all sorts of vehicles.